We supply only the highest quality backup generators for your home or business. GENERAC generators are the most powerful and reliable home and business backup generators. Because GENERAC was the first to create safe and affordable standby generators for the home, they have become the top manufacturer of home backup generators in the country and on Long Island. Power Pro Service Company is proud to offer GENERAC generators to Long Island. Their generators have won multiple awards for their quality, including the Good Housekeeping Seal for the Guardian Series of portable generators and home standby generators. GENERAC also manufactures both automatic and manual transfer switches and accessories used for backup power applications. Power Pro Service Company provides GENERAC Generators to Long Island, offering you not just reliable power in case of emergencies, but more importantly providing peace of mind. Your home and family will be insulated from the dangers and inconveniences of power outages and blackouts. All your valuable electrical devices such as televisions, computers, and appliances will be kept safe from sudden interruptions in the flow of power, which can damage their sensitive electronic components. GENERAC generators Long Island are not only affordable, they are usually significantly quieter than other generators. 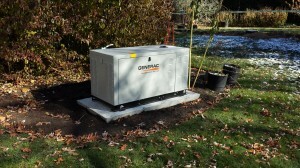 GENERAC generators are installed permanently, which means they add value to your Long Island home. Because GENERAC generators are automatic and run off your current natural gas or LP fuel supply, you don’t need to maintain or refuel them in an emergency like other generators. When you lose power in a hurricane, thunderstorm, or ice storm, the last thing you want to be doing is going outside to refuel your generator. With GENERAC generators, you don’t need to worry about that. GENERAC generators are perfect for your business simply because they are the best around. When your business loses power, you start losing revenue immediately. A backup generator is a necessary component to protect against the dangers of power outages. GENERAC generators end up paying for themselves very quickly once you realize they are guarding your revenue stream. Just a single day of lost power can mean tens of thousands of dollars’ worth of lost revenue. Don’t let lack of foresight cripple your business; get a GENERAC generator for your Long Island business today, and keep your business running. Power outages are more frequent than many people realize. Up to half a million Americans go without power for an hour or more every day. Additionally, GENERAC generators feature the latest features, such as Code Ready, which allows for preconfigured options to ensure that your GENERAC generator Long Island is always up to local code. GENERAC generators are available in all voltage configurations. When you choose GENERAC generators, you get a generator manufactured by one of the most innovative companies around. That means your home or business stays one step ahead of the curve. Don’t let power outages cause problems for you; when everyone around you is without power, you’ll be enjoying the modern conveniences that electricity provides. GENERAC generators provide an option for almost every possible situation on Long Island. Whether you need a generator to keep your home running in an emergency or a multi-megawatt paralleling solution, GENERAC has you covered. It’s not hard to understand why countless Long Island homeowners, along with businesses in virtually every industry are protected by GENERAC generators.